The dazzling flash of yellow forsythias, which offer a splash of fleeting colour after a hard winter, fade and drop in March hedges barely fulfilling our craving for a fix of colour. Usually daffodils bring the next cloud of bright sunshine-yellow much to the delight of all spring revellers. This April sadly I have not seen them. While walking in and around our village I could say truthfully my eyes have been drawn upwards to marvel at the countless orchard trees in blossom. I should also write that my eyes and thoughts have been turned inwards searching for solutions. I have reached the conclusion that I cannot be a full-time mother and continue to work on the growing list of 'to be made to commission' and 'to be written by a deadline' items after dark when my children are asleep. My body has been sending me cleverly crafted signals which have stopped me dead in my tracks: migraines! Oh, the migraines I have had! It's hard to find solutions when your head hurts, your children cheerfully chatter, your puppy makes that face again and your dreams are waiting in the wings to be made real. For an impatient, easily inflamed soul like me the answers need to snap into place quick sharp; no dawdling, please. We all know however that solutions and answers will only come in their own sweet time. And so I bide my time and learn the art of patience. The best remedy of course it to walk and gather inspiration from Mother Nature. Fortunately I have found the vivid yellows and greens of daffodils in other splendid forms. The lichen-covered vines are bursting forth. Primroses are abundant in the undergrowth flanking the vineyards. And rows upon rows of tulips sway like balloons in the breeze in this hillside garden lovingly tended by the deceased owner's daughter. I had the joy of re-reading Anna Parkinson's wonderful book Nature's Alchemist: John Parkinson, Herbalist To Charles I, recently. John Parkinson was, in my opinion, patience personified. His lifelong passion for plants was intimately bound up with the struggles of faith during the turbulent early seventeenth century. Despite his regular presence at the court of Charles I and his central London apothecary he kept a low profile, being a Catholic, quietly growing an extraordinary range of flowers for delight and pleasure in his garden in Covent Garden. He carefully recorded them all and had them engraved for his exquisite book Paradisi in Sole Paradisus Terrestris, first published in 1629. John Parkinson's daffodil (no. 8) and those of his friends, illustration from Paradisus, 1629, taken from Anna Parkinson's book. The most startling feature of John Parkinson's book, to quote, Anna Parkinson, "was that it was the first English book about plants to be devoted above all to their beauty". He believed that one could create a paradise in the tiny enclave gardens to be found in the crowded city that London had become. John also called this book his 'feminine' work, thinking of the gentlewomen among his clients for gynaecological remedies and beautiful plants who shared his love of flowers. Anna Parkinson writes: "He often wrote about women's speech, their desires and their needs. John's garden released feminine aspects of himself in which he revelled, such as his mircroscopic reverence for colour and detail. [...] When he recommended bulbs to his readers, he gave advice on how to care for them because 'I do wish all Gentlemen and Gentlewomen... to bee as careful whom they trust with the planting and replanting of these fine flowers as they would be with so many Jewels'. Bulbs were expensive, especially tulip bulbs from Amsterdam, but for John these flowers were more precious than their mercenary value. Working with his plants with the care and devotion that gentlewomen applied to their needlework, John wanted to show that nature could offer an equally satisfying result.". The link made by John Parkinson between flowers and women's needlework fascinates me. We all know how gardens lend themselves to a variety of art forms. I am particularly drawn to how gardens may be transformed into bodily apparel. The picture above of Daffy-Down-Dilly, taken from Salley Mavor's exquisite Pocketful of Posies: A Treasury of Nursery Rhymes and the garden inspired painting below by the artist Jess of Purpletreebird are both examples of what make me tick. As a tribute to those much loved and unseen daffodils and to ease my solution-finding mind I have knitted two cardigans using Rowan Tweed DK in Avocado Green and Rowan Fine Flecked Tweed in Leyburn Yellow. One was knitted up in the blink of an eye whilst eating date and wholemeal scones and drinking Chai with my children. The other required patience! The Knitting Gods were laughing at my knitting zeal for halfway through my first effort I came to the sorry conclusion that - and you too will laugh - my tension was wrong! Quick as a flash with a heavy sigh I switched from 3mm to 3.5mm needles and started all over again. I could paint a poetic image here. True, I spent a lot of time knitting this cardigan under apple trees in blossom over Easter but many hours were also spent fumbling through a haze of aching headaches. The human-sized cardigan is Orianna Eklund's Daffodil, which is a beautifully easy pattern to follow. 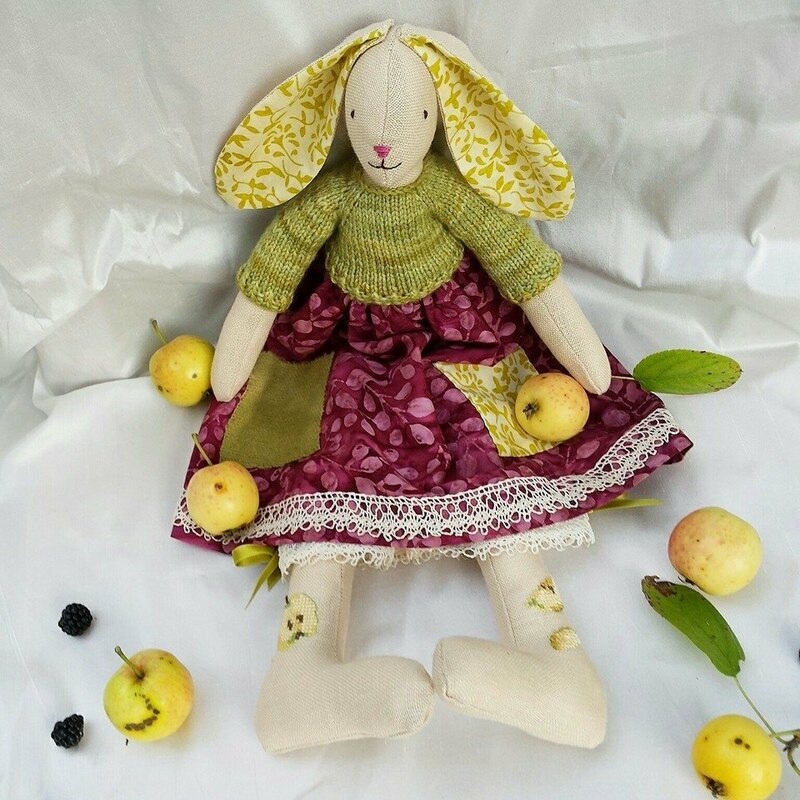 The little folk sized cardigan is Claire Garland's doll clothes pattern conceived for her knitted Easter hare. If you aren't familiar with her enchanting blog dotpebbles to take a peek. I leave you with a photograph of my constant companion's, Angélique's, helping hand. Thank you so much for patiently waiting for my return and your kind, kind words about my rabbits in the previous post. I have been surprised and excited to see how in real life they seem to be in demand. More on that later.